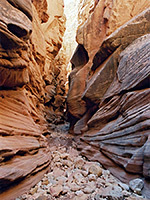 Probably the best slot canyon system in the whole of the San Rafael Swell is found not through the upturned cliffs of the reef, but winding across open grasslands in the south central region, a place known as Sinbad Country. 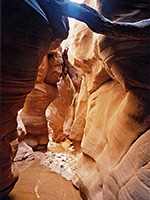 Here, the upper end of Chute Canyon and its Baptist Draw tributary cut deep into Cedar Mesa sandstone, forming long stretches of twisting, very narrow passages through colorful, nicely patterned rock, equal in beauty and extent to the Navajo canyons of Page. 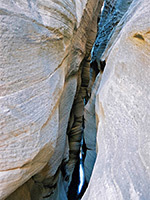 Like some of these Lake Powell slots, upper Chute has dryfalls, pools, logjams and various points that require ropes to pass, but the majority of the narrows can be descended without any equipment though this is still a demanding canyon to explore, and one where the conditions can change dramatically after floods. The canyons are reached from an eastwards side track along the main road to Tomsich Butte/Hidden Splendor Mine, 4 miles south of the junction with the road to Reds Canyon. 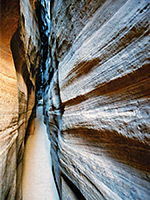 The track was little used until a few years ago when the canyons first became publicized, and remains rather bumpy and narrow for much of its course across open prairie, passing no particular landmarks until the grassy plateau begins to break up into a series of valleys, when distant cliffs and canyons come into view. The track may be suitable only for 4WD if particularly muddy, and always has one steep, rocky spot that may stop some vehicles even if dry, though this occurs quite near to the end, just after crossing a neck of land between the ends of two shallow canyons, so cars could be parked here. Just after this point, the track forks, with the left branch soon splitting into various lesser tracks, all ending in bushy land near the plateau rim, beyond which the land falls away above upper Chute Canyon. There is no shortage of nice campsites along the latter part of the approach road. 8 views of Baptist Draw, 14 views of Upper Chute Canyon. TopoQuest topographic map of Baptist Draw and Upper Chute Canyon; the approach track is shown as ending at point 6739T, but it continues a little further northeast along the plateau. The approach tracks lead to the edge of a flat promontory, the north rim of which overlooks the curving canyons of Chute and Baptist Draw, and is high enough to afford views of more distant hills and ridges in the north and east. The route to Baptist starts from anywhere near the far northeast corner of the promontory - down the steep, ledgy hillside into a side drainage, across this and round the right edge of a beehive-shaped rock then down into the small canyon beyond, which is Baptist Draw just before its slot section. Turning downstream, nice narrows start right away, soon becoming quite dark in places, with gloomy, blackish rocks rising above and a few chokestones wedged between the walls. It has a wide section after 10 minutes walking then constricts again and in wet weather contains at least two pools, one of which might have a log to assist in climbing down but would be harder to pass if not. 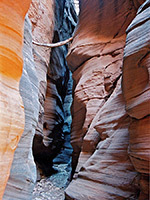 Soon after is another wide part with an entry/exit route on each side, then more dark passages, now deeper, and finally a 5 meter drop that may be free climbable though rappelling is preferred, followed soon after by a drop of over 20 meters as Baptist Draw joins upper Chute Canyon. To see the best part of upper Chute Canyon without rappelling requires walking all the way back up Baptist to the entry point and climbing the gently sloping cliffs on the north side to meet a faint path that follows a ledge high above Chute, a canyon visibly much deeper than Baptist, round the end of a ridge and down into the boulder-filled creek bed when the walls become less vertical. As before, the narrows start a short distance downstream, shallow at first but markedly deeper once past a chokestone and 3 meter drop - an obstacle that is a little difficult to pass when returning. 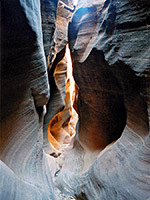 The canyon is then only one meter wide or less for long stretches, interrupted only by small drops, pools and boulders, and so forming an excellent sustained slot. 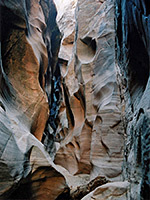 It becomes temporarily wider through a section with several longer pools and mud patches, 3 feet or more deep, but then Chute narrows again, getting ever deeper and darker, as now little sunlight can reach the floor due to overhanging rocks above. One bigger obstruction is created a boulder above a slope down into a pool about 5 feet deep, and this may require a rope to pass. Baptist Draw joins from the right, high above the canyon floor, then not far beyond are several large chokestones in quick succession, of which at least one (possibly more depending whether they create log jams after flash floods) create a drop of several meters, so this will stop those traveling without ropes. 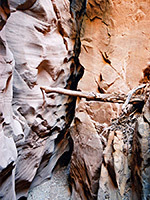 But the canyon gradually opens out below the boulders, though more testing narrows are found two miles further downstream, then, after 4 more miles, Chute forms another narrow gorge as it passes through the San Rafael Reef, close to Crack Canyon. From the chokestones near the lower end of the first narrows, the return journey again involves walking all the way back through the narrows and either retracing the route back to the east end of the plateau, or hiking further upstream along Chute Canyon (a pleasant walk, but meeting no more narrows), climbing the cliffs and walking cross-country in a southwesterly direction back to the approach road. One natural route is along a shallow, grassy valley, a tributary of Baptist Draw, the upper end of which meets the access track just before the steep part that might stop some vehicles.